This topic contains 12 replies, has 3 voices, and was last updated by tonydavies 4 years ago. I’m researching my Wolverhampton canal boatmen ancestors who lived on Cannock Road in the second half of the 19th century. They lived at various addresses on the road – at numbers 32 and 37 for the longest period of time; also North Bridge Street and Lansdown Terrace. I’ve looked at the 1901 Ordnance Survey maps of Wolverhampton to try and work out where exactly these addresses were, but without any luck. I’m guessing that they would have been at the lower end of the road nearest Cannock Road Junction? Can anyone help me with more information,please, on where they lived and which maps I can get hold of that might show in more detail the roads and neighbourhood. The family name is Owen. I’ve had a look online and the only Lansdown Terrace I can find is on Tettenhall Road. I coudn’t find North Bridge Street, but there is a Bridge Street in Springfields, just off the Wednesfield Road. On the 1901 OS map for Wolverhampton NE it’s shown as running across the top of Culwell Street and Bagnal Street, and alongside the railway line. This address is close to the Birmingham Canal so could be a possibility. There’s also a site on the internet called RootsChat which, like Billy’s board, is free to join and there is a section on there for boat people, so that may be worth looking at. The people on there are very friendly and helpful. If you need any more help feel free to email me. You can find my email address by clicking on my name at the side of this message. Many thanks for your reply. It’s been really helpful. I made a mistake with the name of Lansdown Terrace – I should have written Newbridge Terrace! I can only put this error down to having written the post late in the evening! If you can give me any insights into where this terrace might be, that would be great. Thank you! Tony is very likely right with his suggestion of Bridge Street Springfields as that was much nearer the canal than Bridge Street Park Village. There may be a possibility though The location could have been near Cross Street North off Cannock Road Just below the Canal there on Cannock Road was a line of Terraced properties that dropped down a bank from the footpath amongst them was a public House In 1923 Spennells Directory this is 32 Cannock Road. It’s nice to make the acquaintance of someone else from a Wolverhampton boatman’s family! 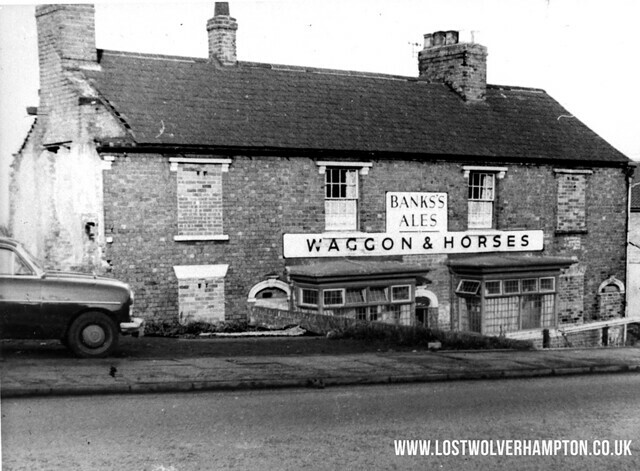 Thanks for posting that evocative photograph of the old Waggon & Horses pub. Is the new Waggon pub (the one that’s now been closed down?) built on the site of the old one? According to one of the late 19th century Censuses, the Waggon would have been only a few doors away from where my family lived then. Would I be correct in thinking that the sort of houses on Cannock Road in the mid- to late 19th century would have been of the ‘two-up two-down’ type of workers’ cottages/terrace houses? My great-great grandparents were married at St Mary’s (now under the ring road) and most of their children were baptised there. Perhaps the above adjoining row of properties were once known as Lansdown Terrace. (Source: Note sometime in late 1835, a certain John Jones, aged 28, stole 7cwt 2qtrs of iron from the canal boat of one Joseph Kirk, in Wolverhampton. He was committed to prison by the Rev. J. Clare. Interesting snippet about John Jones, Billy. Transportation was usually a one way ticket. Even after you’d served your sentence the onus was on the released prisoner to fund their own passage back to Blighty. I wonder if John Jones ever made it back? Good programme on at the moment – Banished. It doesn’t paint a very nice picture of life as a transportee. According to Black Country History – http://blackcountryhistory.org – there was a Newbridge Terrace, Cannock Road, so Billy’s assumption that the demolished terrace next to the Waggon and Horses was Lansdown Terrace could well be right. Alternatively, it could also have been Newbridge Terrace. Normally one would assume that Newbridge Terrace was in the Newbridge area, but who knows what goes through the minds of town planners!! I’ll see what I can turn up on either Ancestry or RootsChat. Thanks Tony. That’s very useful. I need to pay a visit to Wolverhampton again to take a look at Cannock Road and the canal. Last time I visited was 35 years ago! I tried to get in touch via your email address as you suggested, but was not able to make the connection. Am I doing something wrong? The census details above are from the 1881 census. By 1891 it seems that, of the children, only Mary, Joseph, Arthur, and Milbra, are still at the family home with their parents. Daughter Mary is a nail cutter, Joseph is a fitter’s labourer, Arthur is an errand boy, and Milbra is a scholar. The family are still at 37 Cannock Road. So far those are the only two census records I can find in regard to Wolverhampton. Well done Tony I am sure your effort is well appreciated by all. One more possibility , Jonny, is that 37 Cannock Road and Newbridge Terrace are one and the same. Victorian builders loved to give their houses names, usually on a plate inset into the brickwork. This extended to the terraces that they built, as in Mimosa Villas, or Elm Cottages, or other grandiose names, even though they resembled neither a villa, or a cottage! I’ve just checked the email address on my profile and it is correct, so not sure why you couldn’t make contact.